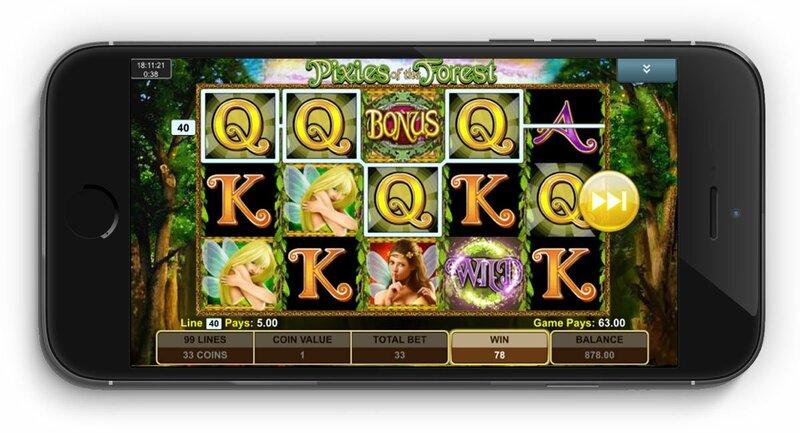 Pixies of the Forest slot machine is a classic slot from IGT that found fame in the land-based casinos of the world, and has now made the transition to mobile. The mobile slot has up to 99 paylines and just the one bonus round, which is a free spins bonus offering up to 11 free spins. The main draw of the game is nostalgia, but also a massive max jackpot of 15,000x line bet. To find out all the details check out the Pixies of the Forest slot review below. For those that want a slot that is simple enough to pick up and play on a mobile device yet still offers the additional excitement of free spins and tumbling reels, the Pixies of the Forest slot from IGT is the game for you. This colourful 5-reel Pixies of the Forest slot machine features adjustable paylines up to a maximum of 99, with all winning icons disappearing in a puff of pixie dust as more symbols drop down to fill their place. As such, continuous combo wins can be racked up without you having to pay a single cent for another spin. The game features wild symbols – which can be substituted for any regular icon – on the three central reels, as well as a free spins bonus that awards a random number of free spins and puts more wild symbols on the board, creating the possibility for some huge chain wins to be accumulated. The bonus symbols can land on any of the five main reels, and should you match any free on a winning payline, you’ll get to flip over one of the symbols to reveal your number of free spins. The bonus game then begins, with wilds now being added to the two outer reels, meaning that the increased number of winning paylines can result in half the board disappearing and being replaced. As such, even if you uncover only a small number of free spins, the bonus game tends to last for some time – with the possibility of two, three or sometimes even more wins being chained together thanks to the tumbling reels feature to award some pretty sizeable payouts at no additional cost. As such, the Pixies of the Forest slot is a low-variance game that can be played at the maximum number of paylines for a relatively small coin outlay. What it lacks in additional features, it more than makes up for in playability, making it the perfect mobile slot for casual players and those on tighter bankrolls. In essence, the Pixies of the Forest slot is a very simple game that can easily be played while on the go, but the presence of tumbling reels and combo wins provides enough excitement to keep players hooked. Like the Pixies of the Forest slot review? Check out these as well…..